New Orleans The emperor with no clothes is not a pretty sight, and it’s almost as bad when the finger pointing at him is Dave Jamieson, a labor reporter for the Huffington Post in a piece entitled “Labor Groups are Taking on Walmart and McDonalds. But Who Will Fund the Fight?” I don’t have anything against him or the Huff Post, but this was a story we knew would be coming, the only surprise might be that it took so long to get here, and it still seems to catch us unprepared with our pants around our ankles. The trigger for this tale is the annual meeting of Walmart gearing up in Bentonville, which has also become an annual action by organizations trying to force one of the world’s largest retailers to more accountability and better practices and standards for its workers. 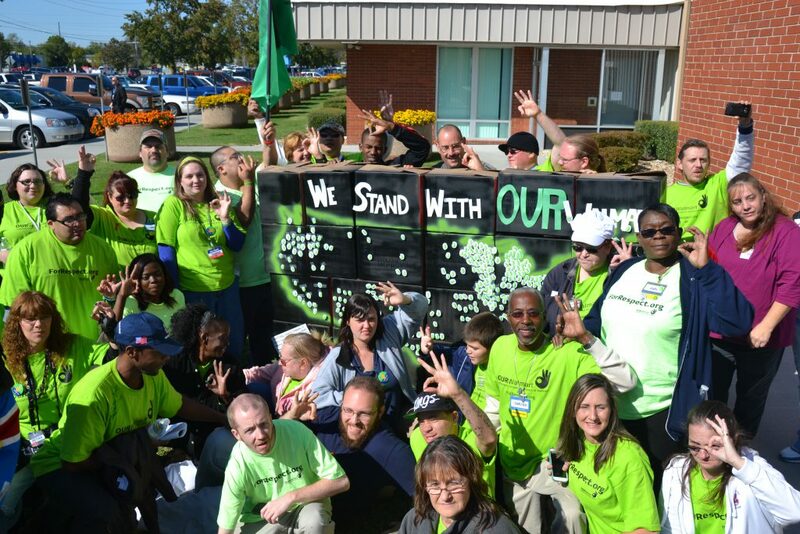 This year OUR Walmart is once again on the scene, but now divorced from its supporter and financier, the United Food and Commercial Workers (UFCW) union and trying to go on its own. A decade ago, UFCW did much the same thing with a competing effort called WakeUp Walmart not so much as to organize but to keep their brand and jurisdictional claims alive and compete with the SEIU-backed WalmartWatch and the multi-union effort we ran to prove that Walmart workers could be organized in Florida and to establish that we could stop their expansion with aggressive work and community allies both in the US and India. New leadership at UFCW jettisoned the program support for OUR Walmart leaving them trying to keep the flame alive, all of which seems terribly reminiscent of our earlier efforts. Jamieson asks the simple question no one likes to hear in public about the viability of OUR Walmart and the sustainability of its effort without a deep-pocketed sponsor. He raises the same question about the multi-year expenditure that SEIU has made to organize McDonalds in companion with its support of the Fight for $15 campaign. SEIU has been resolute in its commitment to these efforts. Both campaigns can claim significant victories. Walmart did move on wages at the bottom. Not to $15 per hour but up to $10 across the board at a cost of billions. SEIU has seen dividends from its Fight for $15 in cities like Seattle and Los Angeles and in states like California and New York where it has significant membership, so they can claim some success from their advocacy. McDonalds does not seem to have moved any closer to the union than Walmart has moved towards UFCW, though closer observers with better information than I have claim that SEIU’s strategy is global, is sound, and may still yield significant organizational victories as well. And, that’s the rub. Unions are not foundations. They have to eventually see members and dues or some direct benefit from the expenditure of dues or the reaction will be predictable, just as is was with UFCW’s leadership change. And, when it comes to funding, foundations are not a substitute for workers and their dues or workers and their unions. Foundations will shine a bright penny for a minute, but they will never double down to the level needed to get to scale in fighting giant enterprises like either of these companies. Can OUR Walmart create a real workers’ movement at the giant retailer with a strategy that produces sufficient organization and membership that will finance a long struggle? It’s possible, we proved that in Florida, but that’s a 10, 20 or 30 year project, and would represent the life work and sacrifice of many to survive, and, even surviving, would, having proven the concept, still need support at some point to get to scale. The same transition will need to occur in the McDonalds’ campaign, but hopefully with the continuity of SEIU’s support and assistance. No one else is going to finance these struggles without workers carrying a huge part of the weight. The publicity is great, but smoke and mirrors is not organizing. David Rolf of SEIU’s big Washington State local, was quoted as saying, “The old model has failed several generations … We should encourage these experiments, but we shouldn’t romanticize it. We still haven’t figured this out.” Certainly, he’s right, but his remarks must seem gratuitous to organizers and workers deep in the struggle. OUR Walmart has proven that the day of reckoning for such experiments comes quickly, so the time for figuring it all out for all of these organizing projects remains now, before it’s too late. Please enjoy Beck’s Wow. Thanks to KABF. This entry was posted in Citizen Wealth, Financial Justice, Ideas and Issues, Labor Organizing, Organizing and tagged McDonalds, Our Walmart, SEIU, UFCW, unions, WalMart by Wade. Bookmark the permalink.